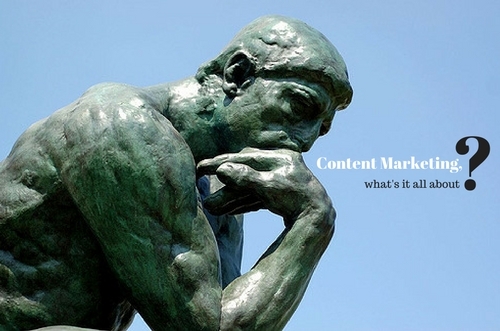 Content marketing, what’s it all about? To all the people out there who don't have the faintest idea of what Content Marketing is but would like to know what all the fuss is about- well, here is a glimpse into this digital marketing phenomenon that could become a real game changer for any business, even yours! Content marketing on the surface is exactly what it sounds like - marketing with content. Content marketing is about marketing your product via different content formats including blogs, videos, posters, photos, infographics etc to your intended target audience. However, it isn’t about 'pushing' your product or service at your potential consumers via direct marketing, but about building a relationship with them by offering useful information consistently. In addition this helps to set one up as an industry leader because of the knowledge and experience shared within a given field. Hence, content marketing is essentially the practice of developing engaging and meaningful relationships with your customers via content development. So how is it different from Native advertising or traditional marketing? Traditional marketing is mostly about getting the customer to purchase a product or service by ‘pushing’ it at them. Businesses who use this method seek an audience in an attempt to persuade them to make a purchase. It is a self-promoting type of marketing. Content marketing on the other hand takes a completely different approach. Rather than placing the product before the customer, the marketeer will publish content that the targeted audience will find useful. In a way it indirectly draws or ‘pulls’ people towards a particular product or service. It is is a very personalised and shareable kind of marketing that engages audiences on a deeper level. It does take a little time before one witnesses results in terms of sales, however the loyalty generated from these efforts is the ultimate and long term pay-off. It does eventually lead to increased sales. What are some other benefits of content marketing? Apart from increased sales, content marketing also helps in developing genuine customer engagement. It builds the brand image positively as it shows a human side of sales through the customer engagement and interaction. One of the bonuses of this form of marketing is that businesses can also attract several unexpected customers. As e-commerce is rapidly growing in India, an increased number of brands are adopting content marketing as part of their marketing mix. People no longer want to see something on the television and just buy it. They crave for personalisation and value and that is exactly where content marketing is making a way into Indian markets. Brands benefitting from content marketing include Zomato, Thrillophilia, JustUnFollow, Nestaway just to name a few. Large, medium and small scale businesses can all benefit from content marketing. To gain a competitive edge in today’s rapidly changing digital world, it has become vital for individuals and surely businesses to consistently reinvent and represent themselves to an audience that has more available options than ever before. One way of ensuring the uniqueness and success of your business is to make your mark by employing content marketing in your daily marketing mix. You'll never want to look back!